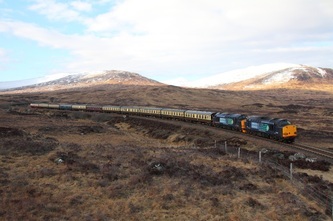 For more recent scottish images, please visit the April 2013 collection. 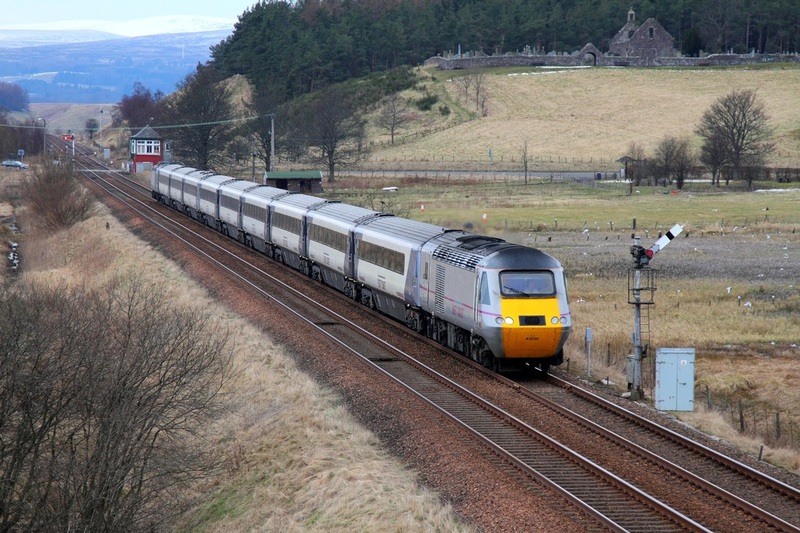 East Coast 43302 leads Ex-National Express liveried 43320 on the 1E17 09:40 Inverness to London Kings Cross at Druimuachdar on the 31st March 2013. 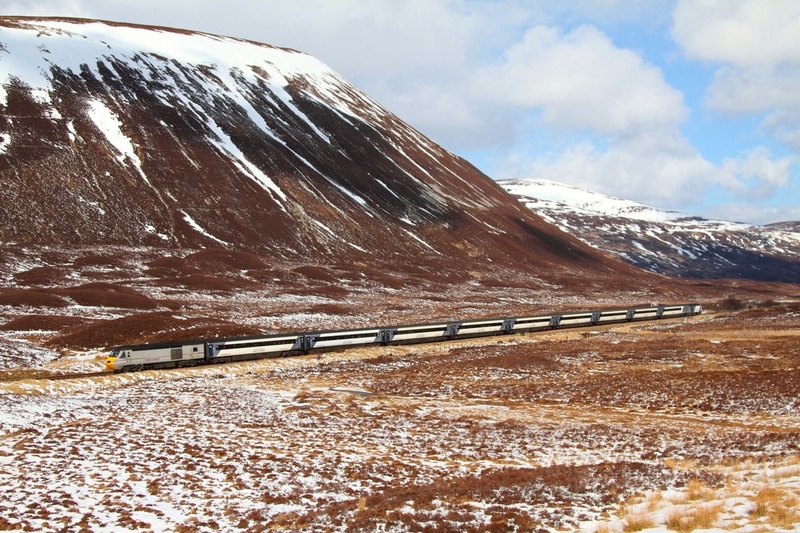 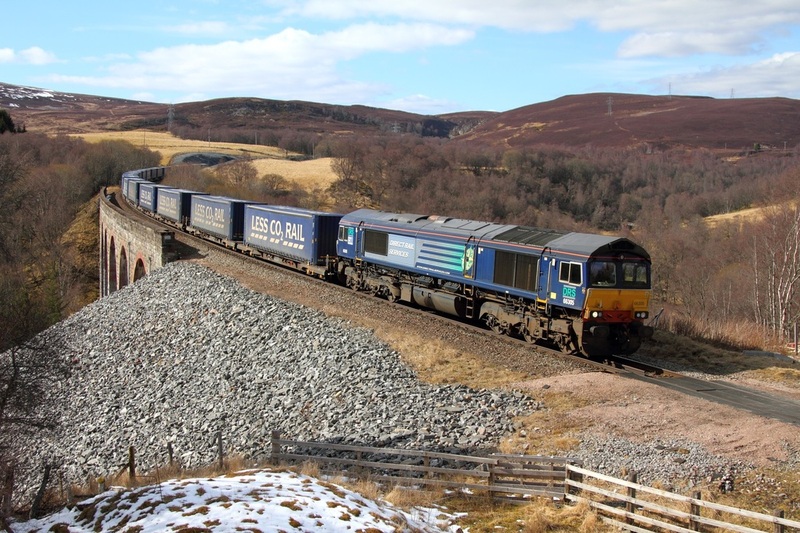 DB Schenker's EWS liveried and RETB 67004 (formerly named Post Haste) powers away from Bridge of Orchy at Achallader with the 1Y11 Edinburgh to Fort William Scotrail sleeper service on the 30th March 2013. 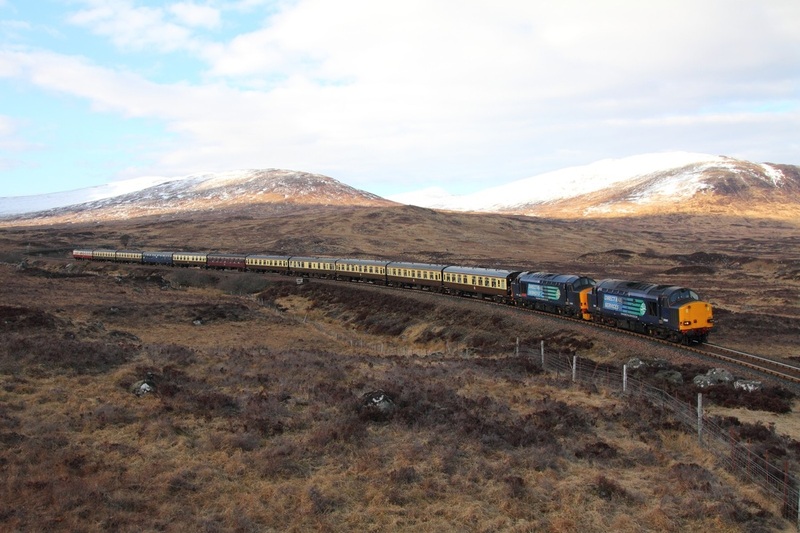 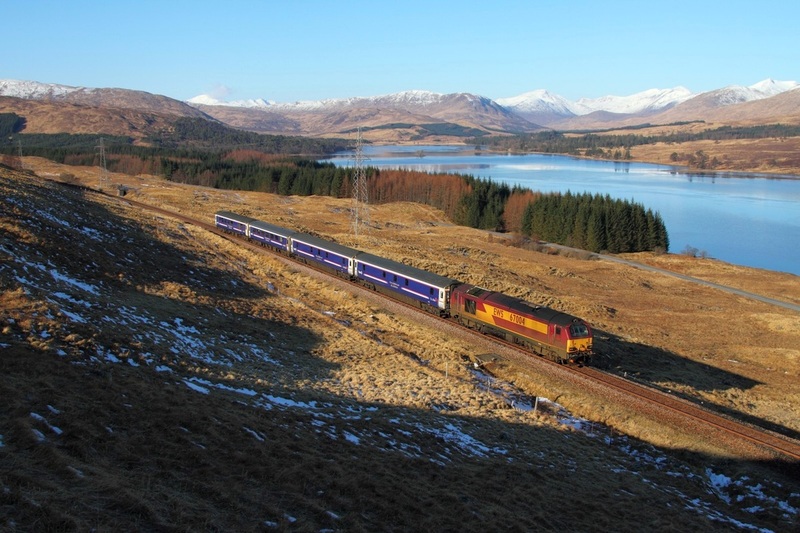 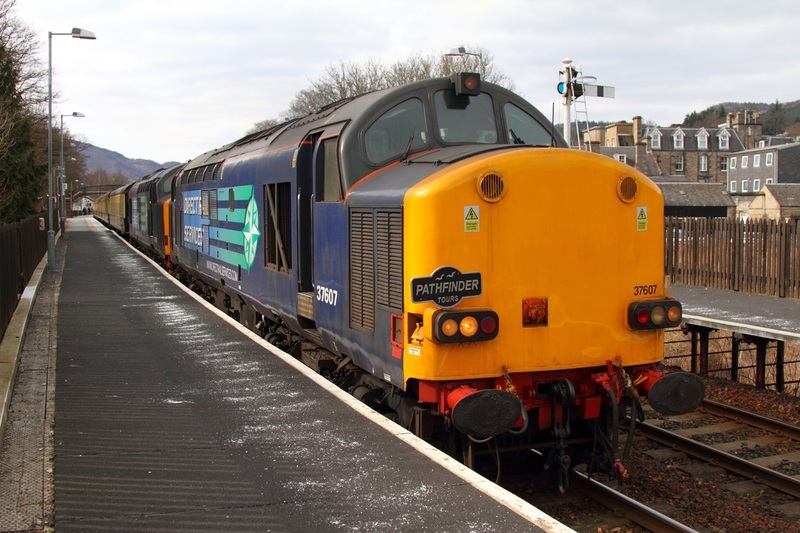 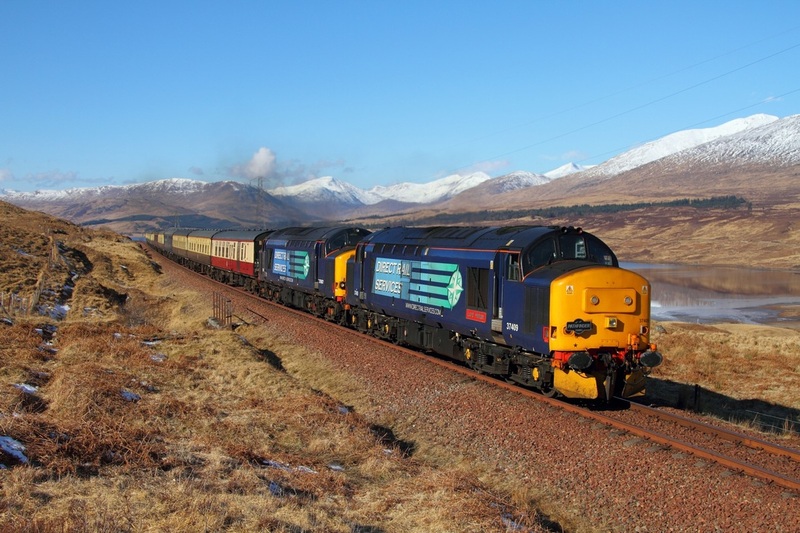 DRS 37409 leads 37607 on the 1Z32 Partick to Fort William 'Easter Highlander' Pathfinder railtour at Achallader north of Bridge of Orchy on the 30th March 2013. DRS 37607 leads 37409 on the 1Z30 05:15 Exeter St Davids to Hexham Pathfinder Easter Highlander at Blakedown on the 29th March 2013. 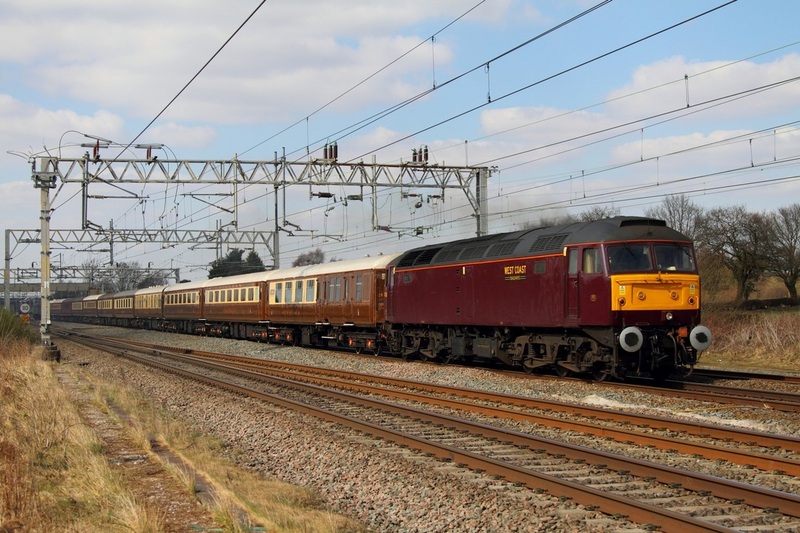 West Coast Railways 47826 leads New class-mate 57316 on the 5Z75 Carnforth to Derby at Acton Bridge on the 29th March 2013. 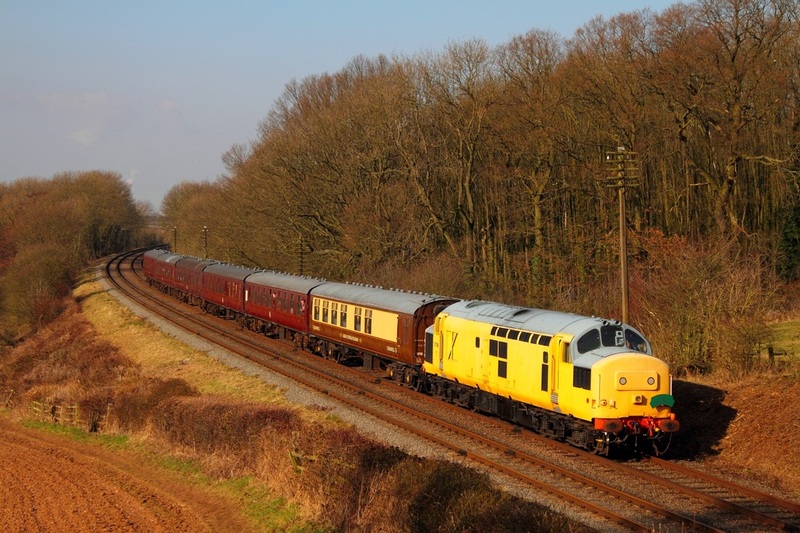 DCR 56303 leads 56091 on the 6Z69 Lydney Loop to Chaddesden thrashing out of Lydney loop on the 27th March 2013. 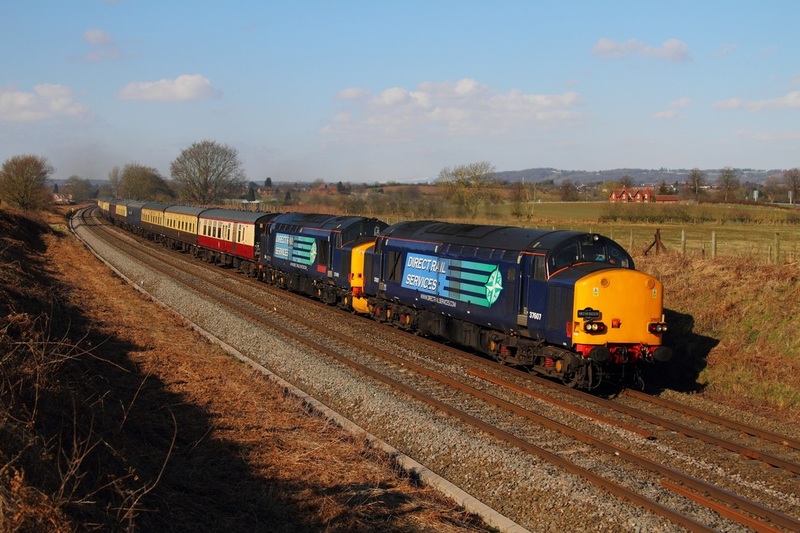 Returning to Derby RTC a little bit earlier than expected due to a train fault, DRS 37423 leads 977868, 6262 and 37604 on the 1Z14 Alexandra Dock Junction to Derby RTC at Gatcombe on the 27th March 2013. 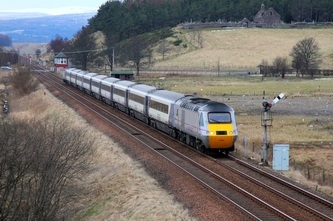 The Growlers were originally booked to test the valley lines tonight before returning to Derby tomorrow afternoon. 60010 rounds Gatcombe powering the 6B13 Robeston to Westerleigh loaded murco bogie tanks on the 27th March 2013. 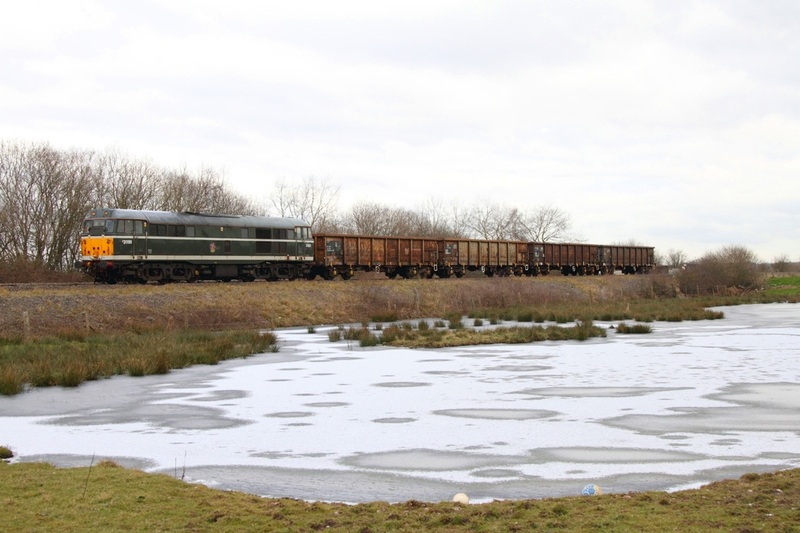 On the evening of the 26th March 2013, DCR 56311 led a failed ex-Fertis liveried 56091 (recently reinstated) on the 6Z69 20:58 Cardiff Tidal to Chaddesden empty scrap box wagons (see video below) only as far as Lydney loop. 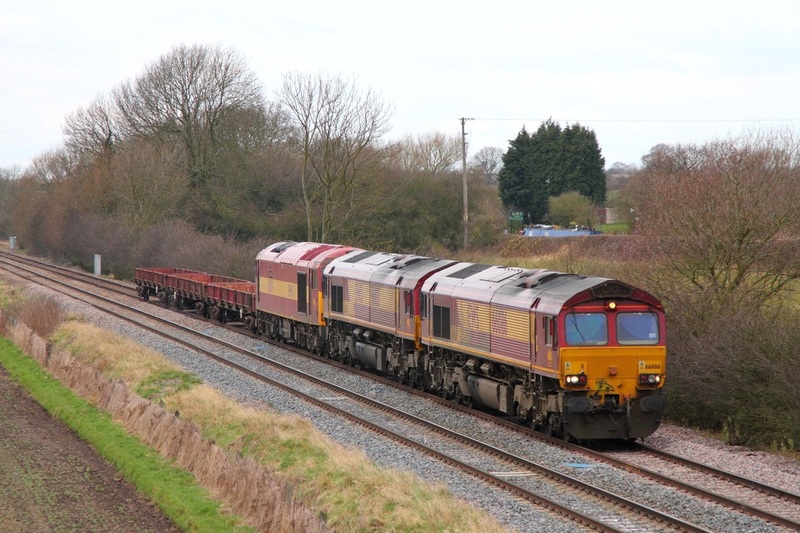 56311 worked the 0Z69 01:45 Lydney Loop to Washwood Heath leaving 56091 and the consist of 56091 in Lydney Goods loop. 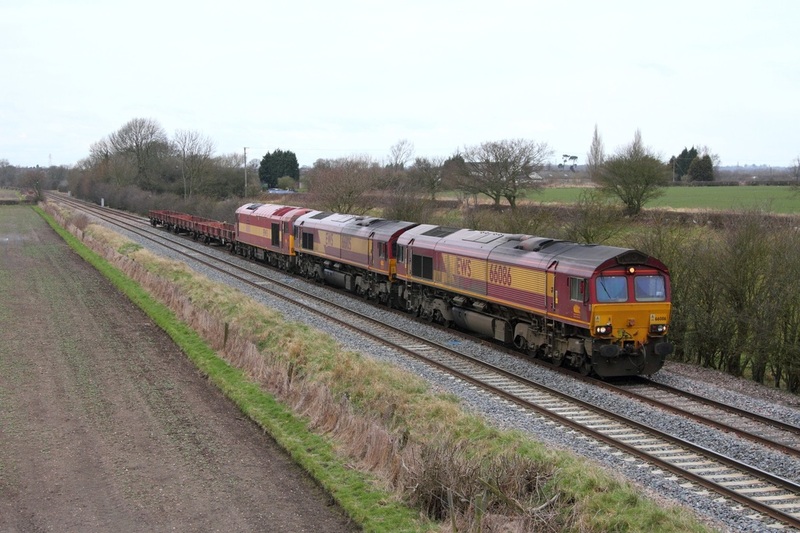 56091 was in a phottable position and is captured in Lydney loop still attached to the consist of 6Z69 on the 27th March 2013. 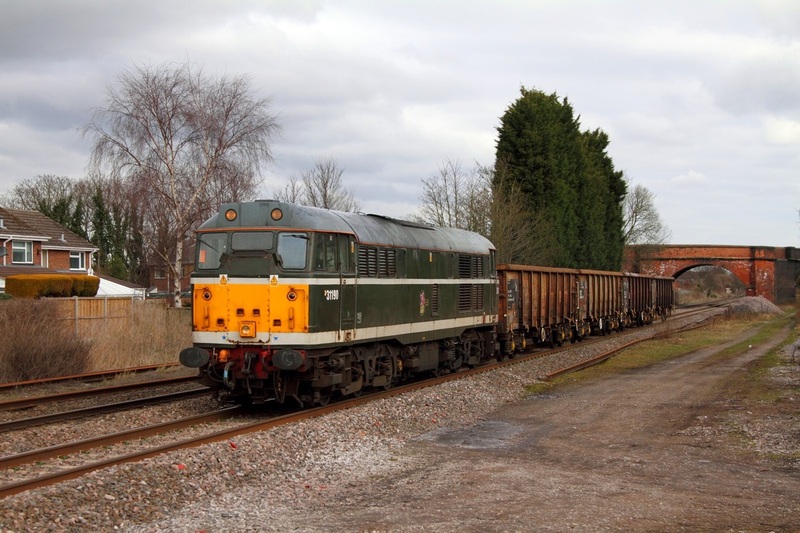 A grid will work the 0Z56 13:00 Washwood Heath to Lydney later to collect 56091 and the train. 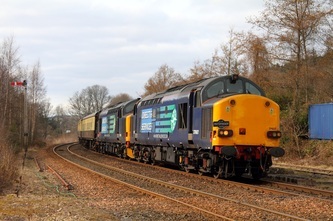 GBRf 66705 leads Former Connex Slammers 3905 and 3918 at Burton Latimer near Kettering north of Wellingborough on the 26th March working as the 5M23 Tonbridge yard to Barrow Hill. 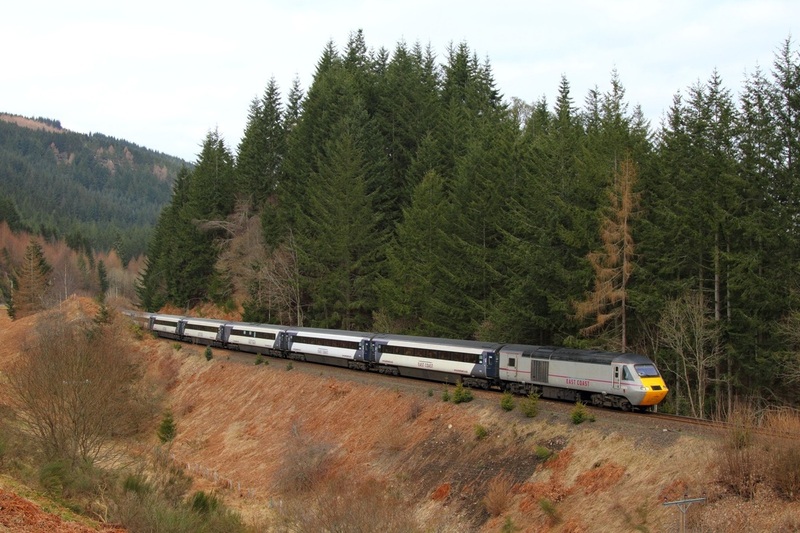 Flying Scotsman liveried 91101 takes test train to St Noets and back! 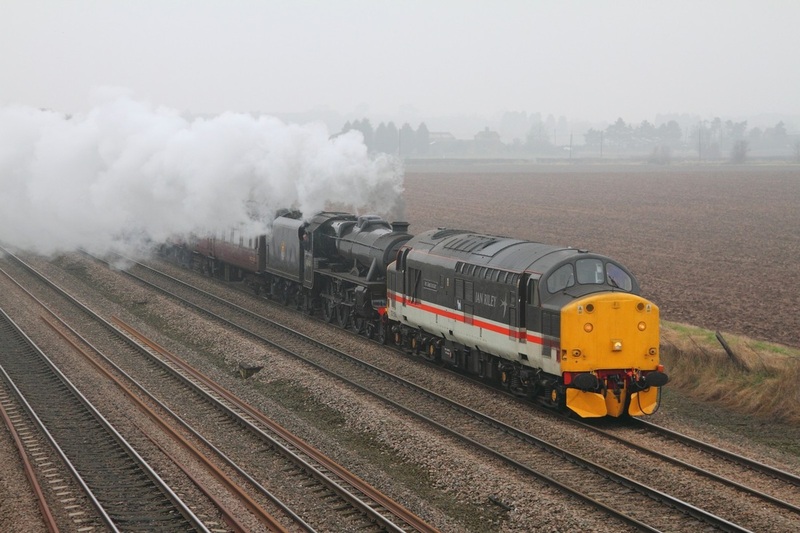 East Coast's Flying Scotsman liveried 91101 (blunt end leading) cruises through Langford south of Biggleswade working the 0Z11 Bounds Green to Bounds Green via St Noets and the relief lines on the 26th March 2013. 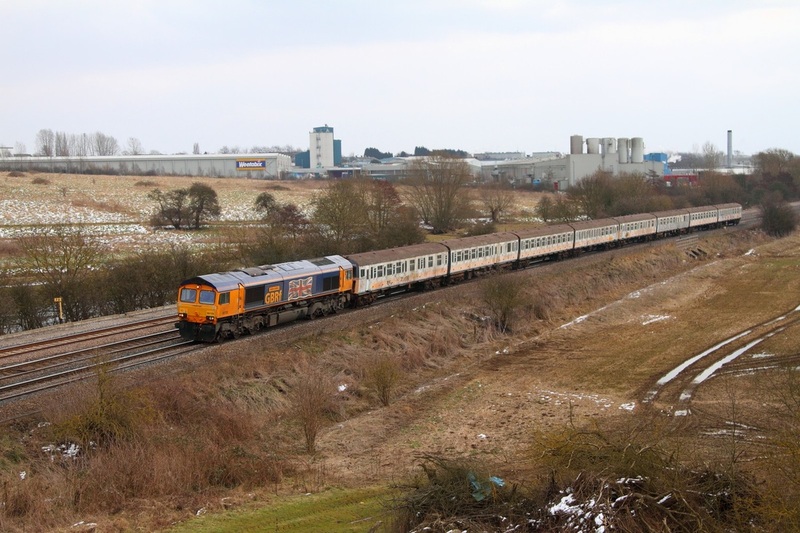 Below: 91101 heads north thru Biggleswade station working a slightly late 0Z11 Bounds Green to Bounds Green via St Noets on the 26/03/2013. 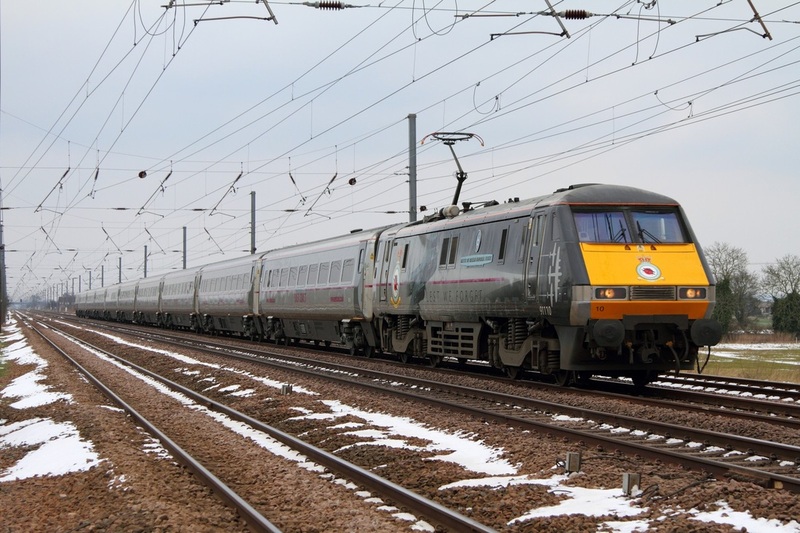 91110 leads the 1D12 11:35 London Kings Cross to Leeds at Langford on the 27th March 2013. 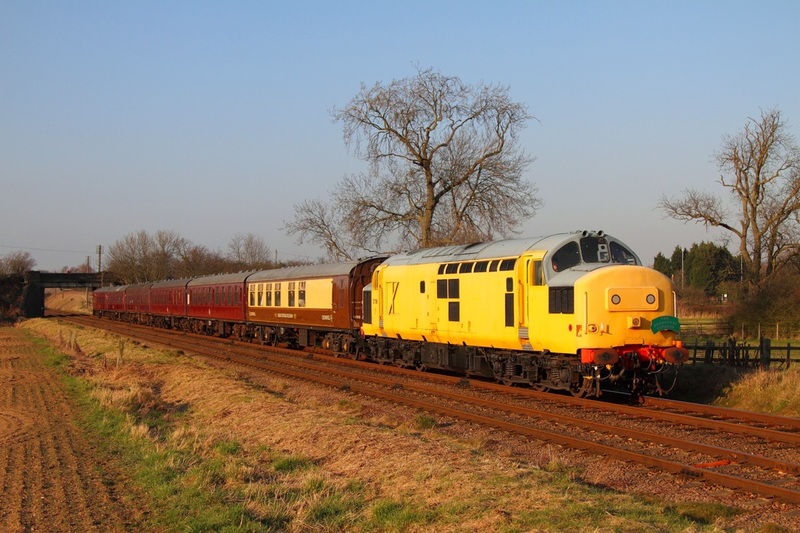 West Coast Railways Company' 33207 ran light engine as the 0Z69 Southall to Eastleigh and then hauled Anglia liveried DBSOs no. 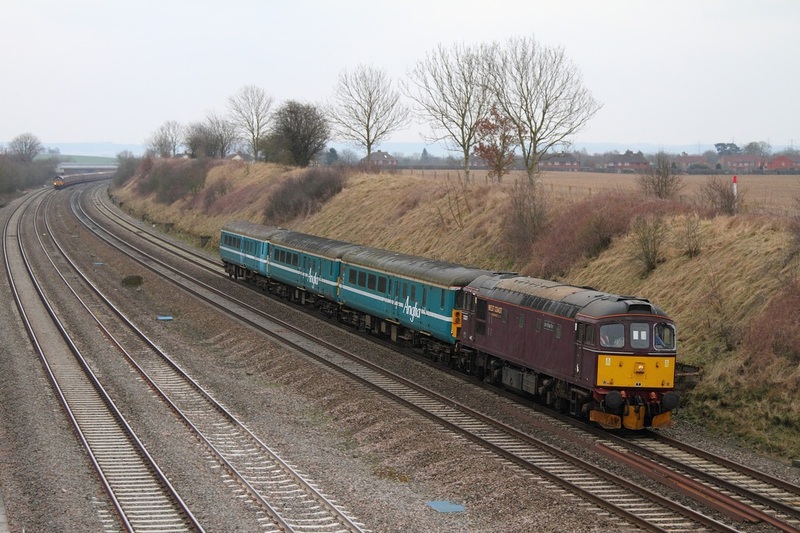 9707, 9705 and 9713 from Eastleigh Alstom works to Derby RTC as 5Z70, the consist is captued at South Moreton nearing Didcot on the 21st March 2013. 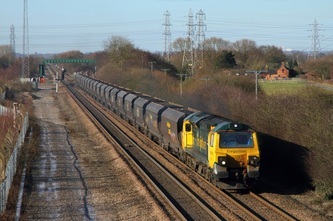 The train 5Z70 was then held in Kennington Goods loop allowing another capture at Hinksey. I photographed the Crompton again at Sandy Lane, Kiddlington north of Oxford after being looped at Oxford North junction. 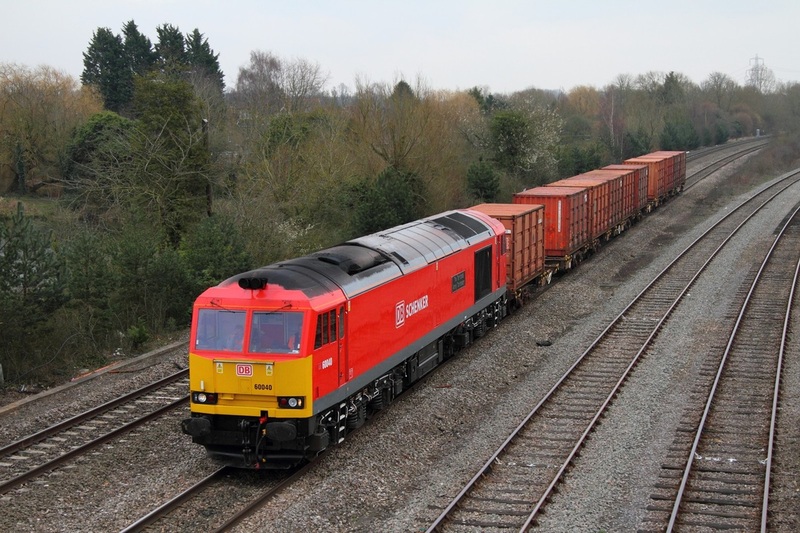 DB Schenker's EWS 60049 approaches Kennington junction powering the 6V27 Eastleigh yard to Hinksey yard engineers on the 21st March 2013. 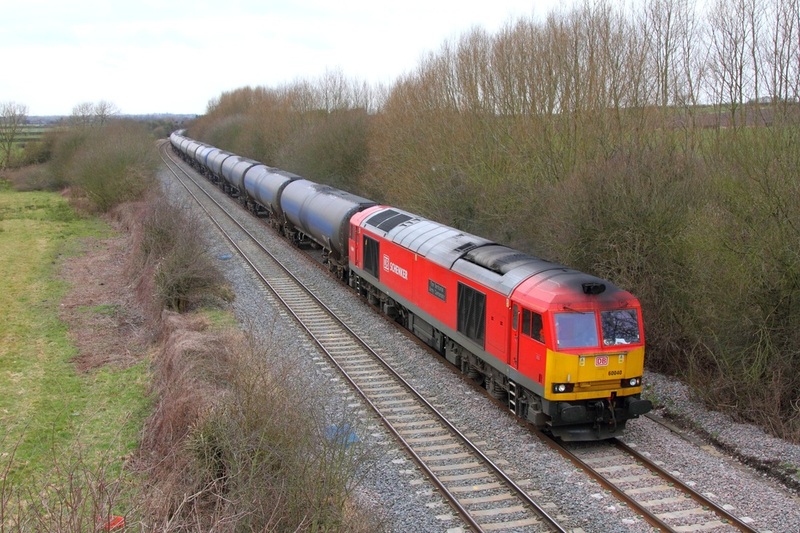 DB Schenker 60040 works the Bicester MoD stores out from Didcot yard! 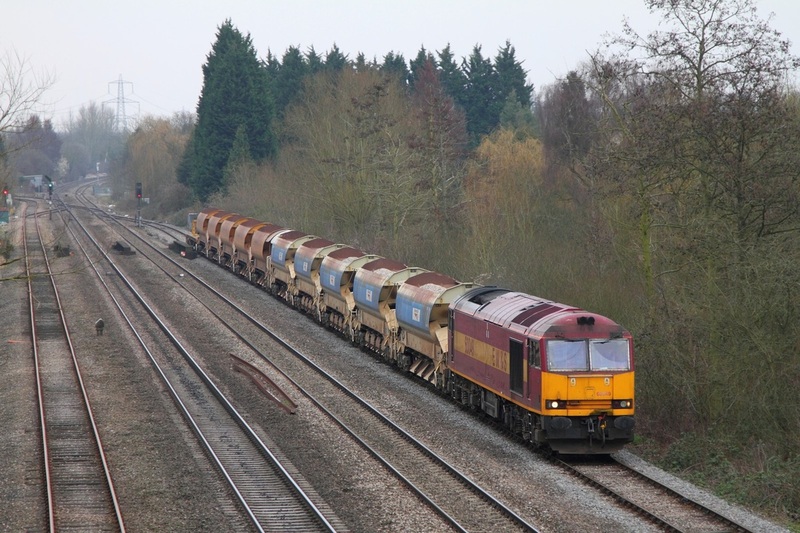 DB Schenker's 60040 works the 6A49 Didcot yard to Bicester MoD freight at Hinksey yard on the 21st March 2013. 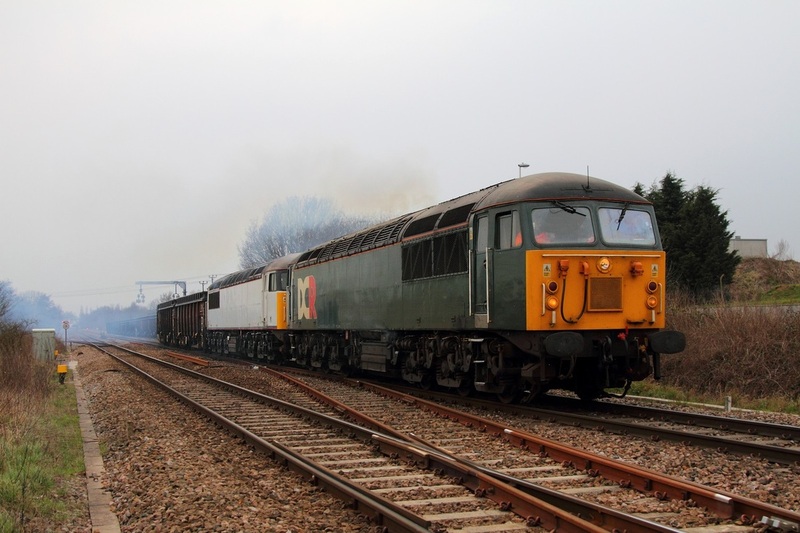 Devon, Cornwall Railways Green 56303 works the 6Z91 Calvert to Didcot at Hinksey Yard on the 21st March 2013. 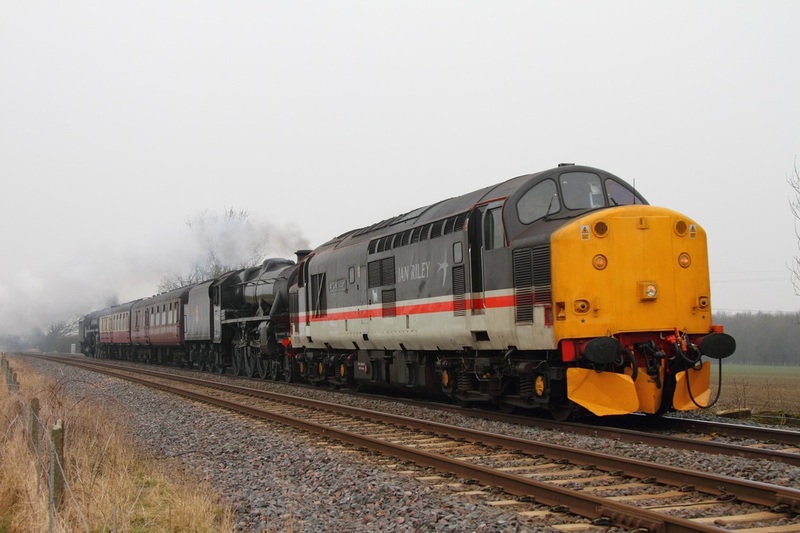 Colas 56094 leads the 6Z56 East Usk Yard to Bescot consisting of VR 97407, DRK 81613, VR 97406, VR 97405, NLU 29095, NLU 29252, NLU 29111, NLU 29012, 503096 and NLU 29098 at Thornwell on the 20th March 2013. 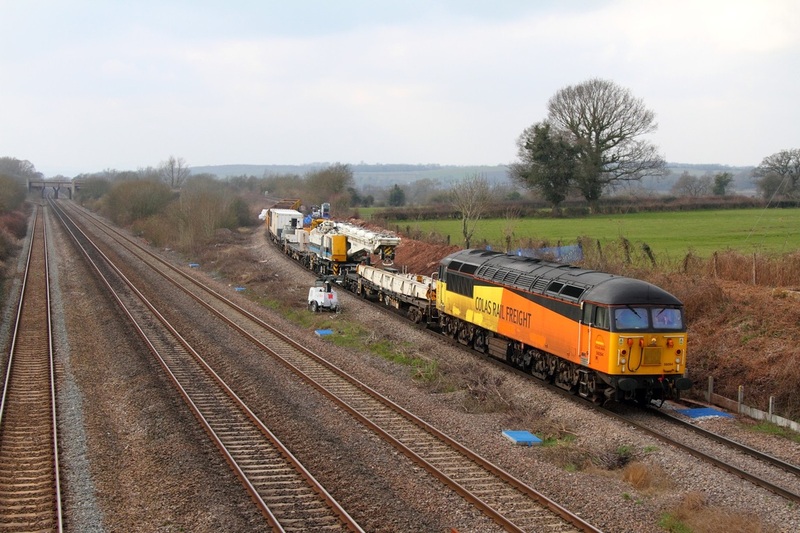 Colas Rail 56094 powers over the Bishton Flyover where drainage excavation is taking place, working the 6Z56 East Usk Yard to Bescot engineers on the 20th March 2013. 56094 has spent time on loan to DB Schenker, mainly being used on coil trains between Llanwern and Newport Docks. 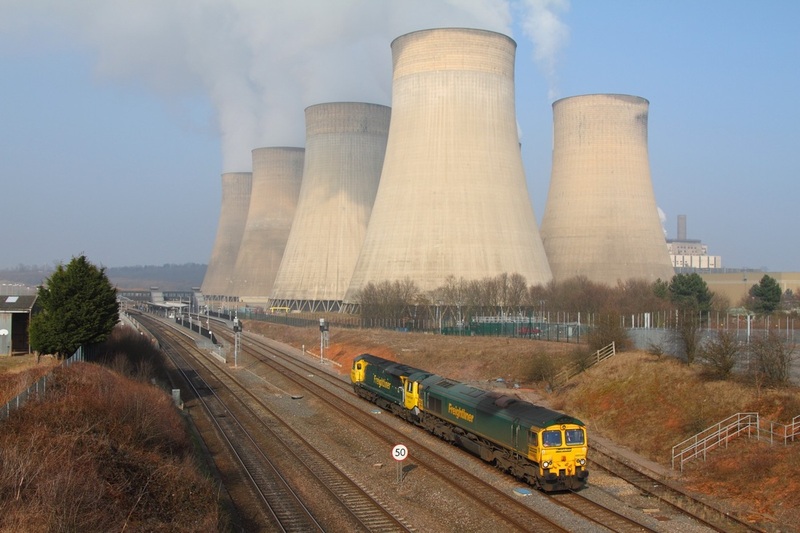 66846 has taken over the timber duties for now. 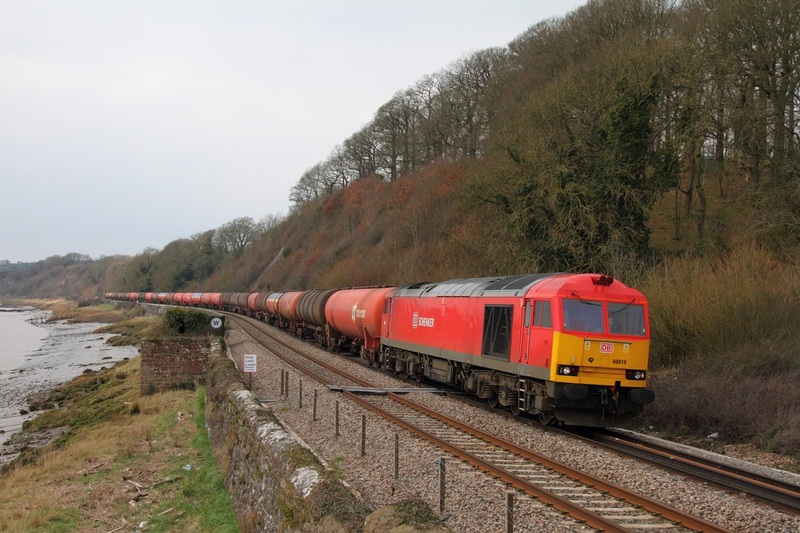 60100 leaves Cornwall for a potential return to traffic with DB Schenker!! DB Schenker's EWS liveried 66086 leads 66105 and 60100 at Barrow upon Trent working the popularly photographed 6D44 Bescot to Toton engineers consisting of wagons 621911, 621914 and 621901 on the 12th March 2013. 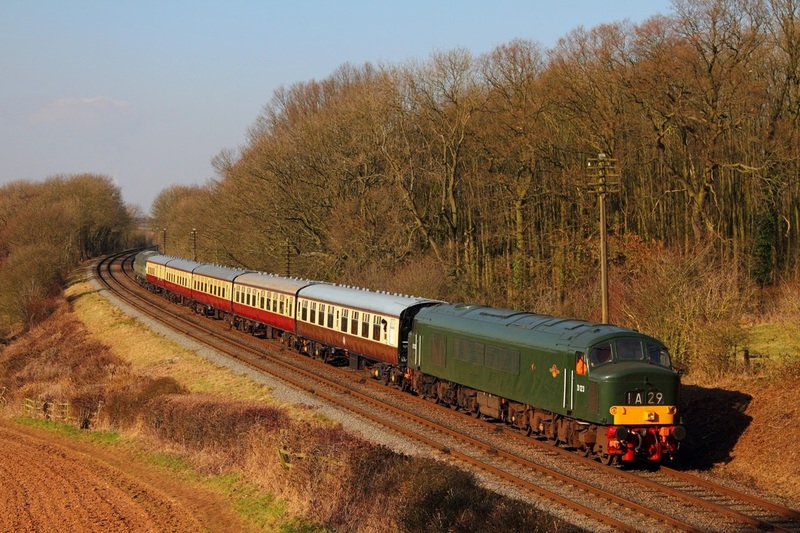 The last built class '60' which has been in storage at St Blazey has been added to the DB refurbishment programme for a potential reinstatement to traffic, and made its journey north yesterday to Bescot in the consist of 6M50 from Westbury. 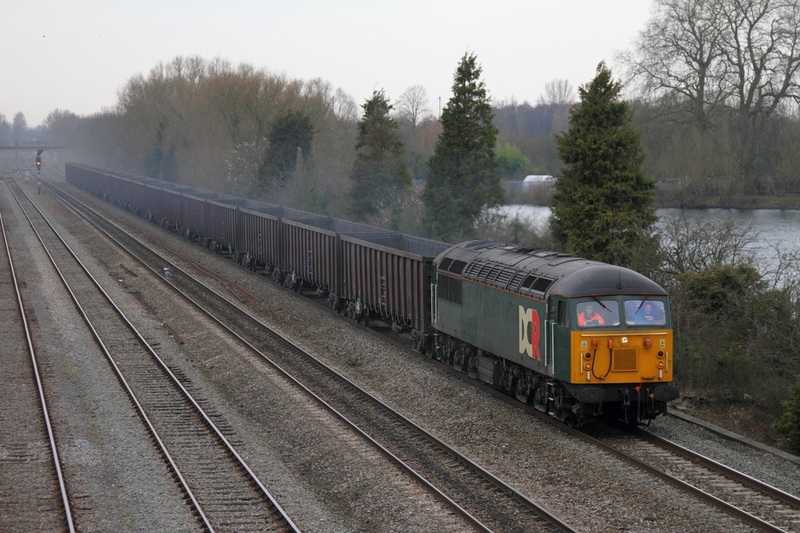 Br Two Tone Green 31190 hauls four JRA box wagons to Eastleigh!! 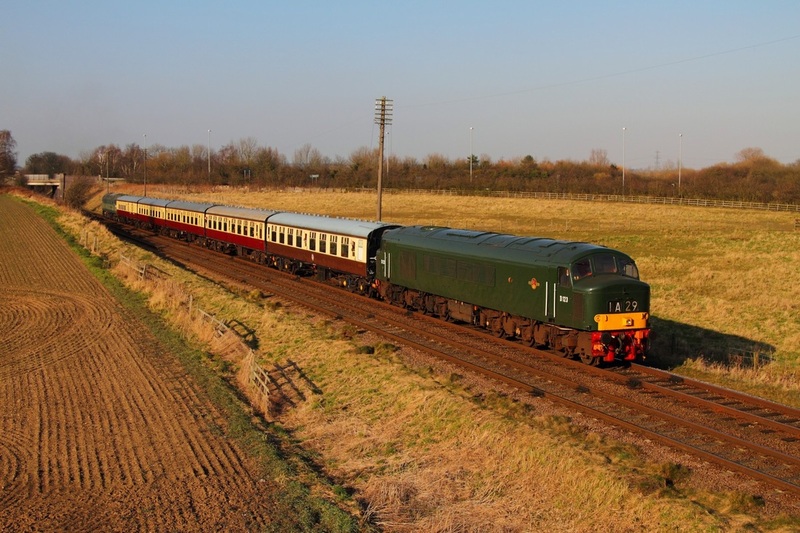 Looking very original in Br Two Tone Green, 31190 escapes Burton at the former site of Branston railway station whilst working the 6Z31 Chaddesden to Eastleigh DCR working comprising of JRA box wagons no. 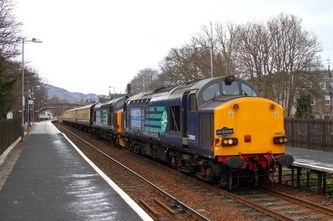 7067900510, 7067900585, 7067900304, 7067900882 on the 12th March 2013. 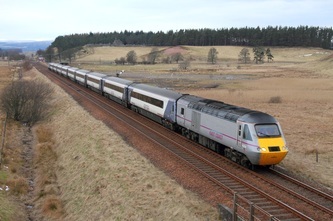 The train was running about 3 minutes early at this point and would be held in Elford loop for half an hour, which is just north of Tamworth. 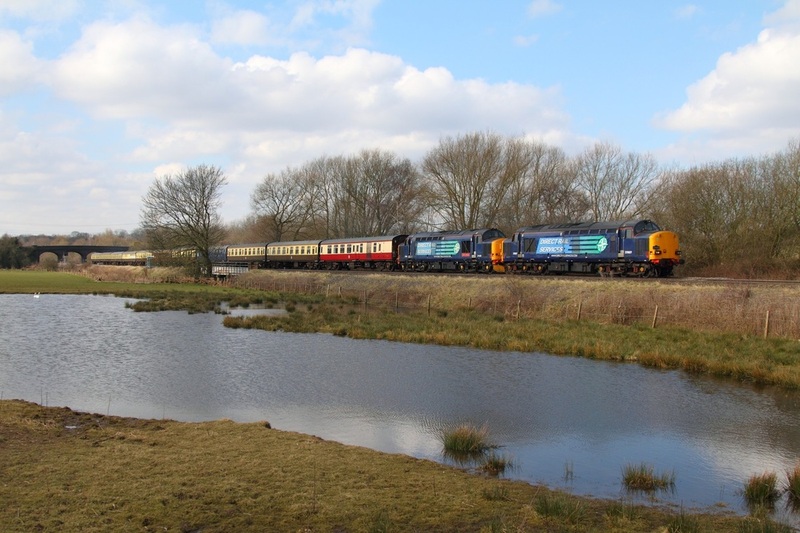 After being held in Elford Loop, 31190 continues its journey south to Hampshire at the frozen pool at Lea Marston, just north of Water Orton powering DCR's 6Z31 Chaddesden to Eastleigh. 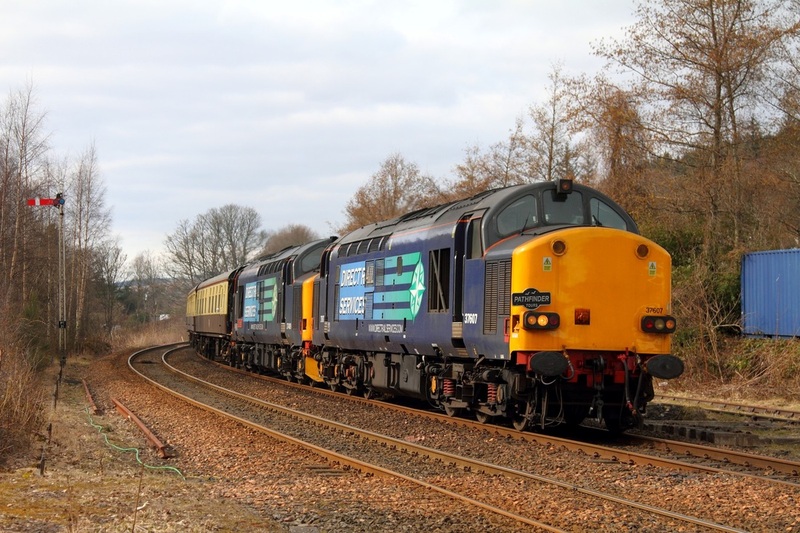 The JRA box wagons are believed to be going for overhaul/repairs. 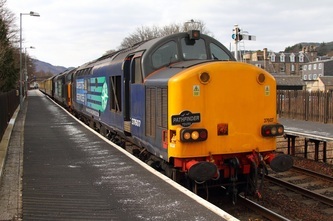 12/03/2013. 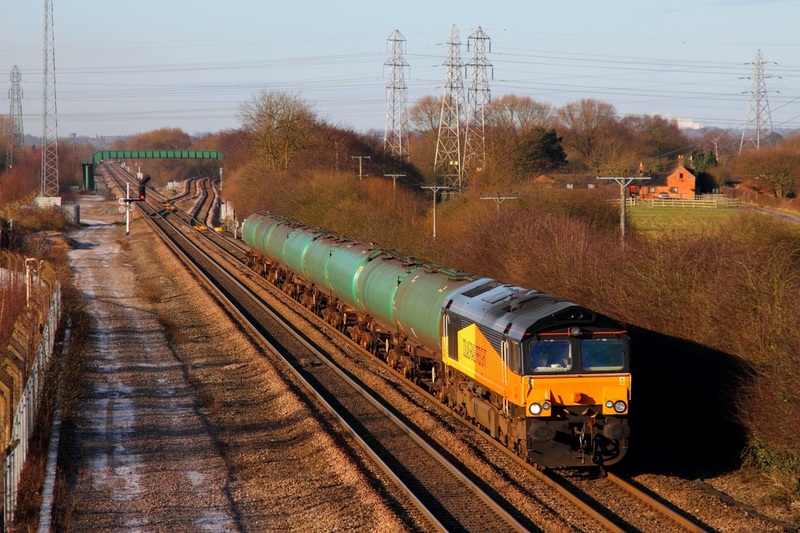 Unsurprisingly Colas 66847 works the Grangemouth to Sinfin tanks again! Colas Rail 66847 formerly Freightliner 66574 leads 6M65 Grangemouth to Sinfin loaded VTG oil tanks at Stenson junction just south of Derby on the 12th March 2013. 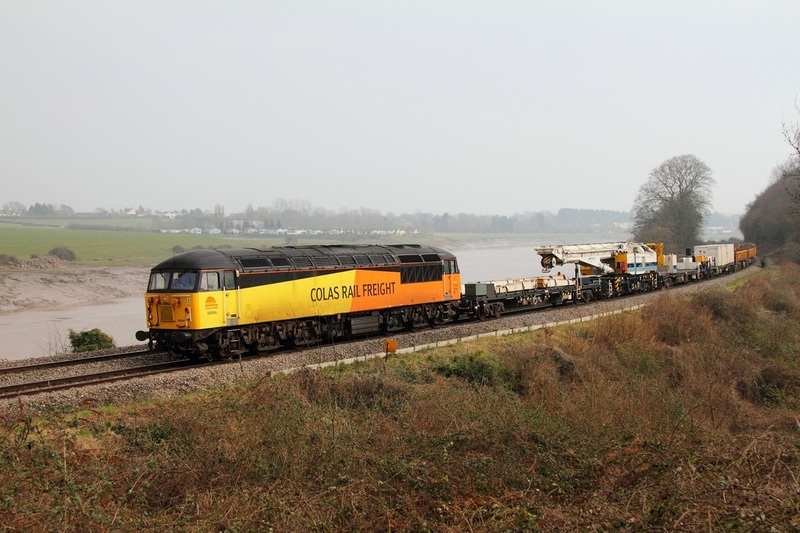 In June 2012, Colas Rail won the contract to transport aviation fuel from Scotland to the Rolls-Royce plant in Sinfin, Derby on behalf of Air BP. 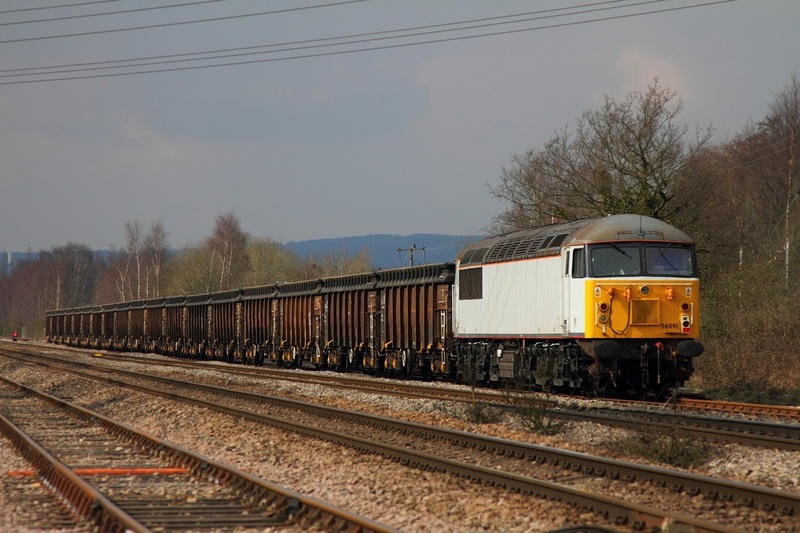 The Colas shed returned the empties in the afternoon as 6S96. 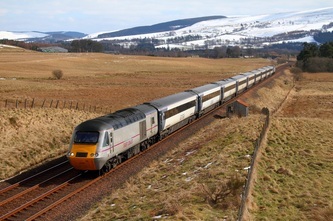 The train mainly runs on Tuesdays and Thursdays. 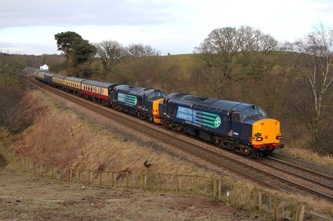 Ian Riley's 37518 leads two support coaches, 45407 and 70000 'Britannia' at Normanton on Soar north of Loughborough working as the 5Z55 Sheringham (North Norfolk Railway) to Castleton (East Lancs Railway) on the 11th March 2013. 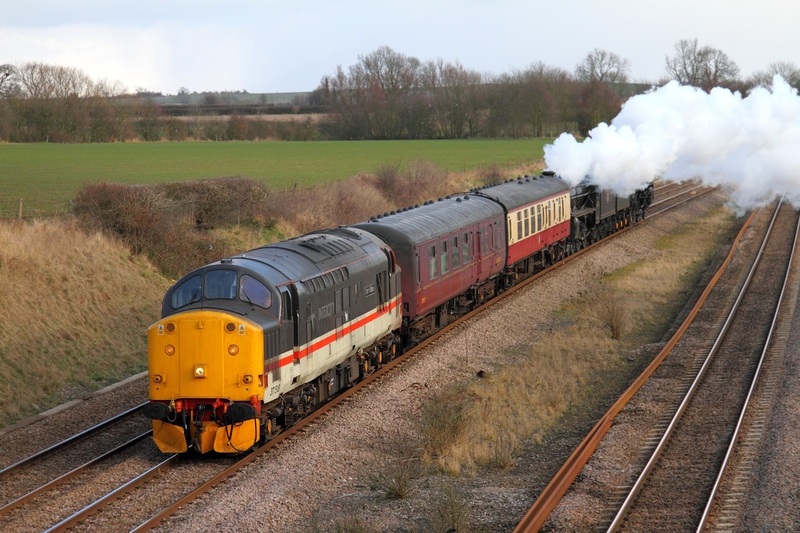 Unfortunately 70000 came into a minor collision with 78019 at Weybourne during the North Norfolk Railway's Steam Gala over the weekend resulting in little participation, 37518 stepped into work some of the diagrams. 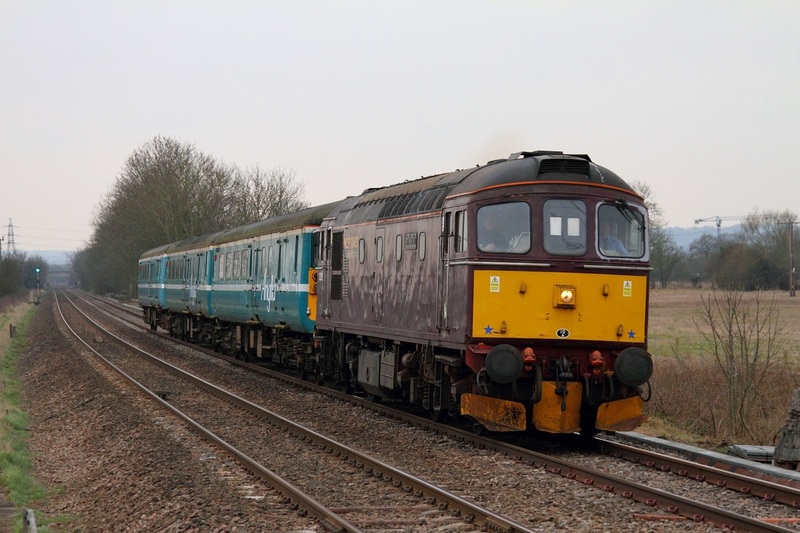 Rare outing on the Crewe-Derby line for Electro-Diesels on Test train!! Ian Riley's 37518 sporting one of my favourite liveries - the Inter City swallow livery hauls 45407, two support coaches and 70000 'Britannia' as 5Z54 Castleton (East Lancaster railway) to Sheringham (North Norfolk Railway) at Syston north of Leicester on the 7th March 2013. 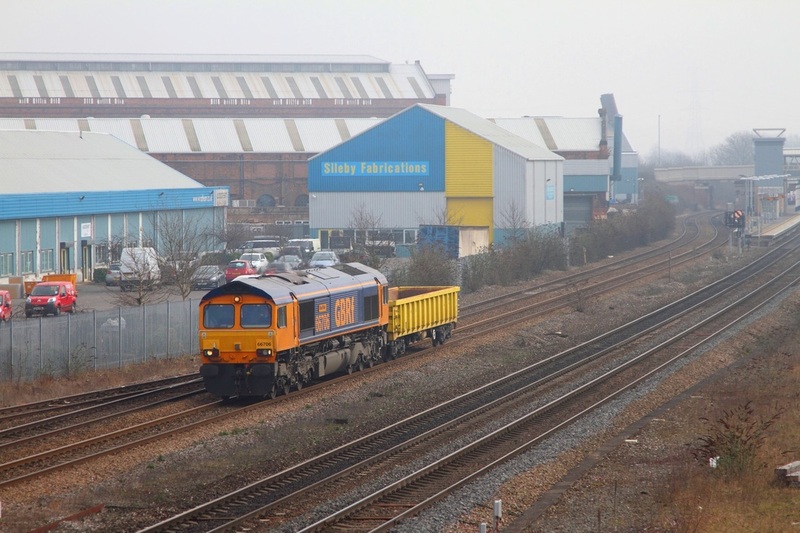 GBRf 73204 'Janice' is captured arriving at Loughborough Brush works on a low loader after being transported from Southampton Docks (orginally from Eastleigh) on the 6th March 2013. 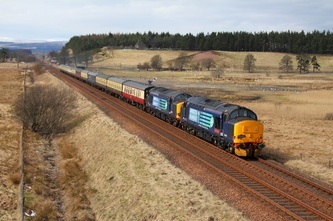 The ED is united with its class-mate 73209. 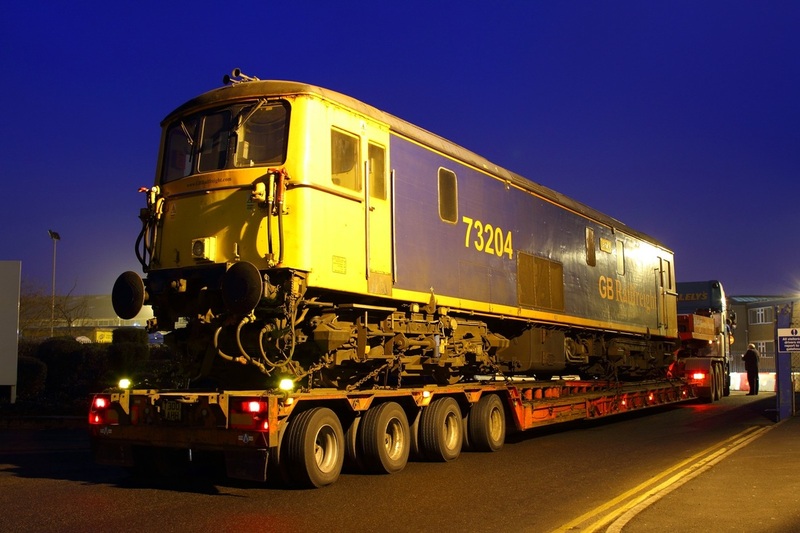 The GBRF 73s are believed to be undergoing a re-engineering project which involves a new engine and most probably a repaint into the new Europorte GBRf colour scheme. 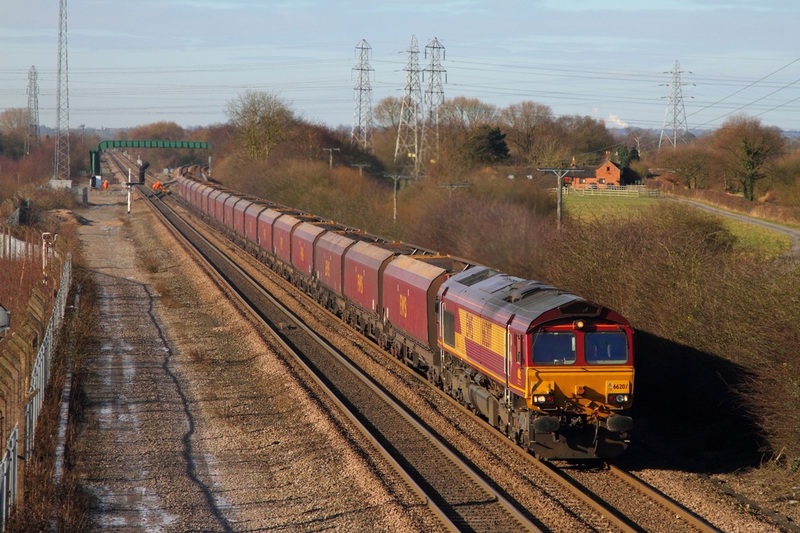 Freightliner's 66545 leads 70002 on the 0Z62 Crewe Basford Hall to Loughborough Brush at East Midlands Parkway on the 5th March 2013. 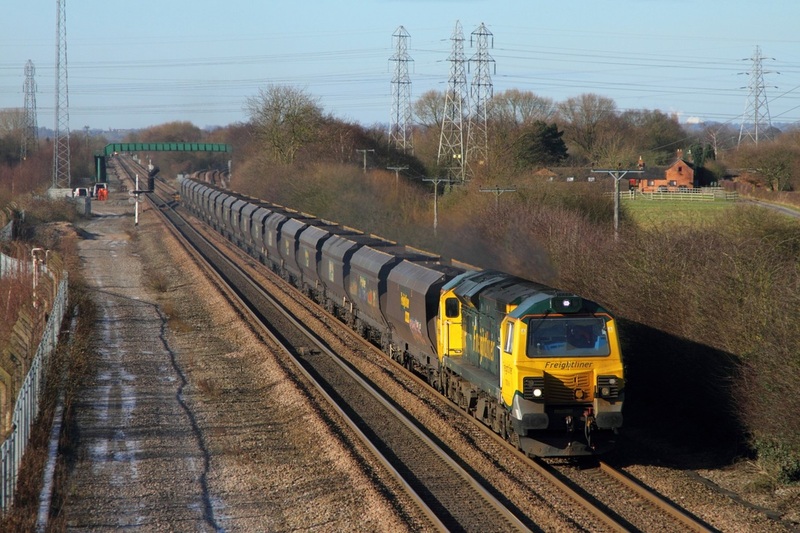 Great Britain Railfreight 66706 'Nene Valley' unsurprisingly makes light work of the 6Z66 Wellingborough to Derby Etches Park and is captured passing Loughborough on the 5th March 2013. 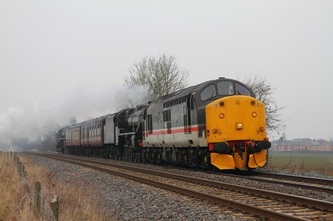 The GM locomotive then returned to Peterborough light engine. 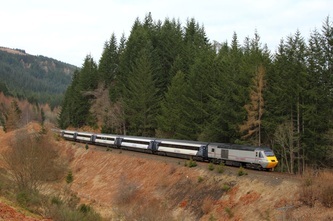 DB Schenker's Railfreight Grey liveried 90036 leads failed Scotrail 90019 on the 1M16 Inverness to London Euston overnight Scotrail sleeper at Grendon, Tamworth. 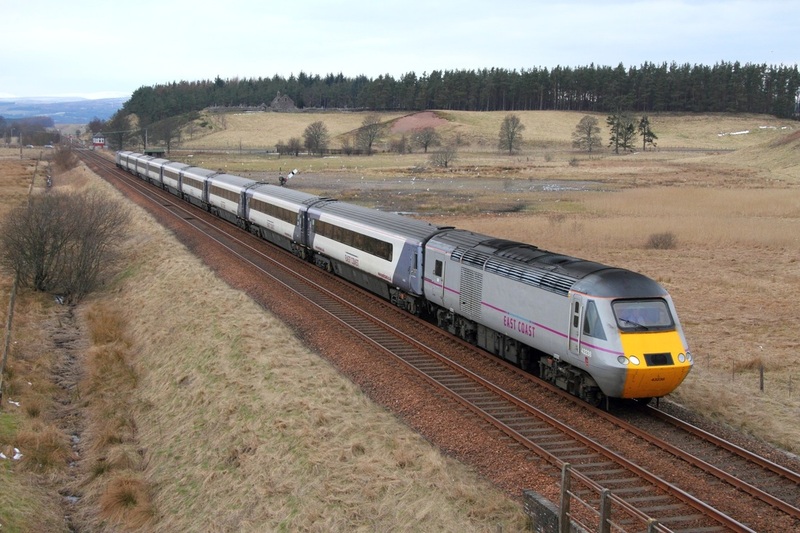 At this point, the train was running 142 minutes late having departed Edinburgh at 04:01 152 minutes down following the failure of 90019 at Edinburgh. 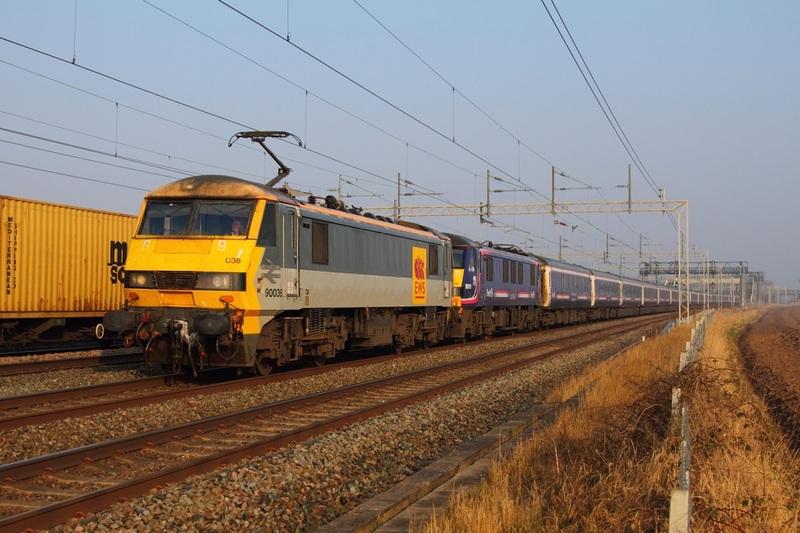 90036 so far has miraculously avoided the paint shop at Toton, 90018 and 90029 have both recently received DB Schenker colours. 05/03/13. 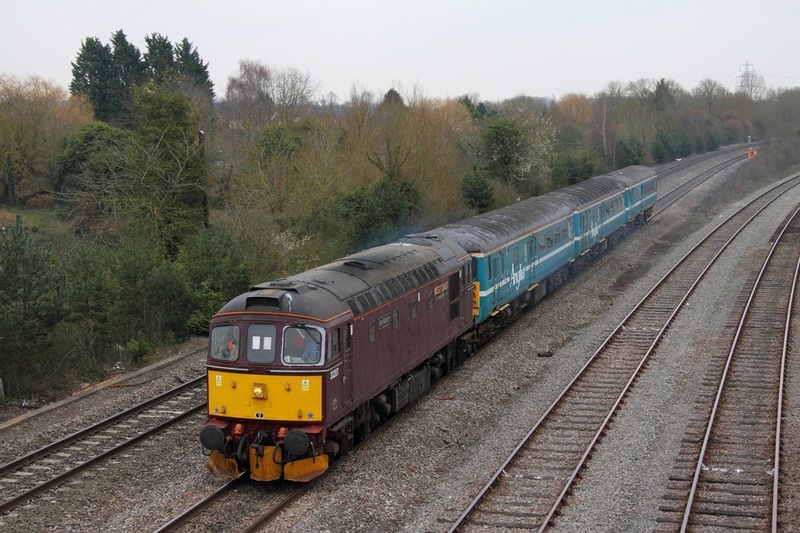 D123 trundles through Woodthorpe with D1705 on the rear, hauling the 2A34 15:20 Loughborough to Leicester North service on the Great Central Railway on the 2nd March 2013. 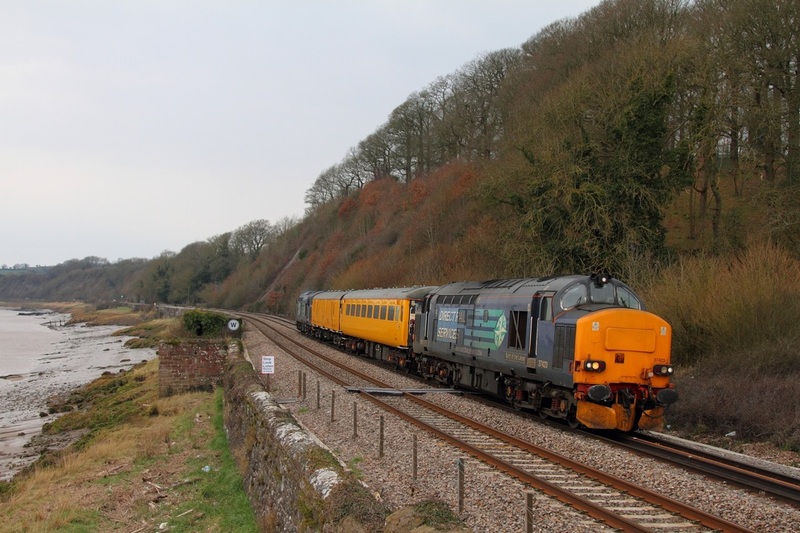 With ongoing rumours suggesting its last appearance on the Great Central Railway, the good weather and diesel gala provided a golden opportunity to capture Network Rail's 37198 working on the railway for possibly the last time. 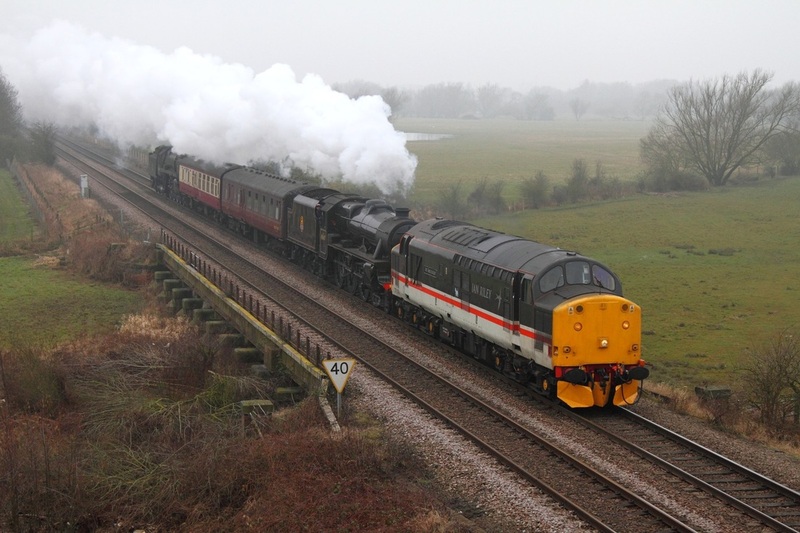 The Growler approaches Kinchley Lane south of Quorn with the 2A29 14:15 Loughborough to Leicester North service on the 2nd March 2013. 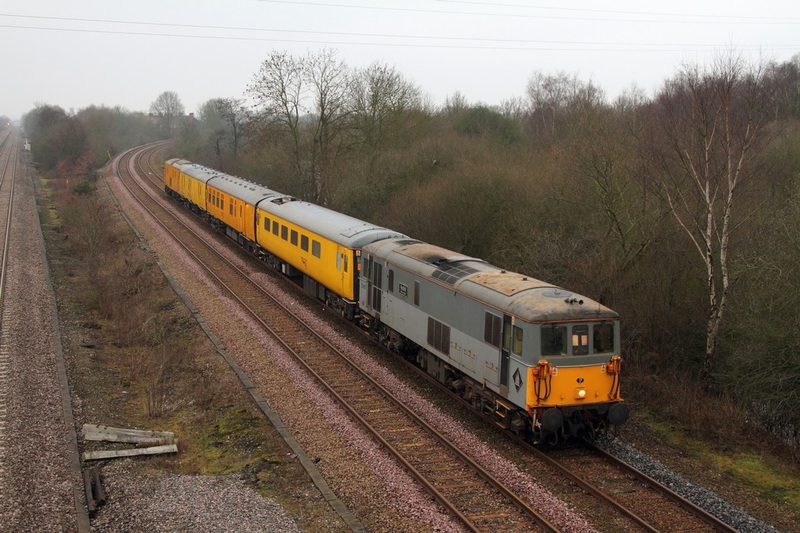 Below: 37198 departs Loughborough at Woodthorpe powering the 2A37 15:45 Loughborough to Leicester North service on the 2nd March 2013.